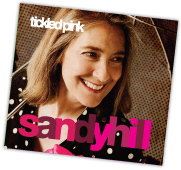 Sandy Hill: Tickled Pink the debut album from Sandy Hill, British female singer featuring Steve Balsamo with special contributions from Jools Holland & Joe Brown, and produced by Sam Brown. 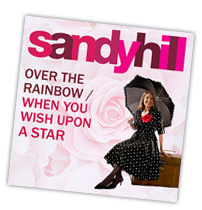 Sandy launches her debut album with a smile. 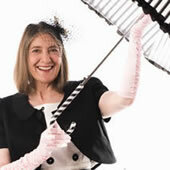 She's 'Tickled Pink' in fact, and who can blame her! 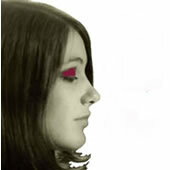 Produced by the wonderful Sam Brown, 'Tickled Pink' captures the feeling and emotion of someone releasing their first studio album with the help of some of the UK's most respected and legendary musicians. Sandy's introduction to recording studios began at the age of just 16 when she walked through the doors of Abbey Road Studios in the early 1970's to work in place that she had heard so much about. A place of dreams, that for her became a second home. Surrounded by some of the greatest musicians and performers of all time she witnessed first hand the daily realities of creating such iconic music. The Beatles, Cliff Richard, The Hollies and Pink Floyd were just some the daily occupants of Sandy's world and the track 'London's Not Too Far', written by The Shadows Hank Marvin, echoes her own journey into this very special world from her love of music as a small child. 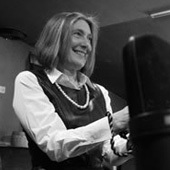 'Walk Right Back', written by Sam and featuring Jools Holland on piano, gave Sandy the opportunity to record an original song and she's delighted with the outcome "It was certainly the most exciting track to record as I had the freedom to take the song where I wanted and Jools added such a fantastic piano sound, it really rocks along." Intriguingly familiar is the track 'Amour Defendu', originally recorded by Mirielle Matthieu, Sandy first heard it while living in Paris in the '90's. "The melody is the classic Spanish guitar piece 'Romance Anonimo' with lyrics added by Eddy Marnay. This is such a wonderful piece and it helped me to learn French at a time when I would explore Paris with my Carte Orange bus pass in my hand, so it is truly wonderful to have the chance to record this song and Richard Durrant's guitar playing on it is just sublime." Less well known but equally evocative is the duet 'Your Long Journey' sung with Steve Balsamo. "It's such a moving song between a couple that you can't help but feel the depth of sentiment in it" says Sandy. "When Steve and I recorded the track I think we really captured something very special, and Steves voice brings a beautiful warm quality to the song." A very different arrangement of Abba's 'Slipping Through My Fingers' marks Sandy's admiration for the work of the Swedish supergroup. "I love the power of their lyrics that blend so well with their beautiful melodies and this, though its hard to choose as they all mean something special to me, is possibly my favourite track. So, when Sam arranged the harmonies so magically, I knew we had to record it. 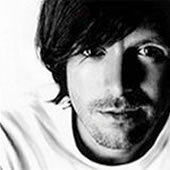 I do hope that Benny & Bjorn like it!" A highlight of the time in the studio was the day Joe Brown, legendary British singer, joined Sandy & Sam to play the banjo on 'I'll Fly Away '. It's a classic piece of bluegrass banjo that Joe relished. So much so that the last few bars captured Joe's spirit of irreverent fun and that laugh you hear at the end of the track is none other than Joe Brown (MBE) himself. The creation of this album was truly the experience of a lifetime for Sandy, with friends from the past like Herbie Flowers and new collaborations with Pete Brown, Dave Arch and of course, The Sam Brown! To say that Sandy's 'Tickled Pink', is putting it mildly.